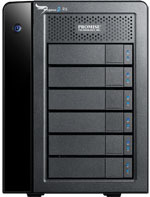 The Pegasus 2 Series is the world’s first line of storage solutions with Thunderbolt 2 technology, the revolutionary technology from Intel Corporation that is the fastest connection to your computer at 20 Gbps. Thunderbolt technology is an enormous enabler for video with its exceptional performance and bandwidth, and Thunderbolt 2 further embraces the growing 4K applications in media and entertainment, mobility, and computing. Running bi-directionally at 20Gbps, double the bandwidth of Thunderbolt, Thunderbolt 2 is a breakthrough for video creators as it enables the simultaneous transfer and display of 4K video files. The advancement in bandwidth will enable professionals to edit and view live 4K streams while backing up the same file to a Pegasus2 system (or multiple daisy-chained Pegasus2 systems) ,while still using the same cables and connectors as the previous generation. The Pegasus2 Series maximizes the available line rate of Thunderbolt 2 to provide blistering fast transfer speeds to dramatically accelerate and simplify 4K workflows. 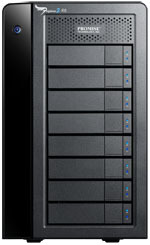 As the first RAID 5 solution with Thunderbolt 2 technology, Pegasus2 delivers enterprise-level hardware RAID protection in a portable package that can be taken almost anywhere - perfect for photographers, filmmakers, and other multimedia professionals. 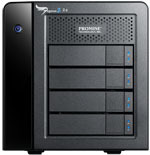 Pegasus2 M4 4TB 4-Bay Mini RAID 5/6 System featuring 2.5" HDDs with Thunderbolt 2 Technology (4 x 1TB) by Promise Technology Part# P2M4HD4US hat is designed for users who require a portable,“on-the-go” solution in remote or offsite environments.